About 20 minutes east of Canberra just past Uriara. The Pig Hill launch, landing and road access are all on private land. It is with the landowner's permission that we are allowed to fly from this site, so please take this into consideration when flying from here. Do not contact property owners for access permission. If contact is required, please contact Geoff Robertson (0429 843 417) or Terri Jewell (0411 236 715) for details. This site is closed. As of 2018-03-16, hang gliding and paragliding activities are not permitted at this site until further notice. The ACTHPA committee will be speaking with the relevany parties in the near future to ascertain whether a mutual agreement can be achieved to continue to use this site. Please check ACTHPA guide for recent changes. The launch is a good 20-30 minutes up the hill and requires a 4x4 for access. It is usual for pilots to meet at the LZ, then car pool to launch. The track leads up the east spur of the ridge from the landing paddock, first along Mountain Creek Road, turning off through the gate opposite the house onto Doctors Flat Road for 4km, make a right turn onto Pig Hill Summit Road and launch is 1.5km further on. There is a map below that provides direction. Please click on this Google Map Link for directions to the LZ. Please remember to close all gates that you have opened on the way. If you intend on a Hike & Fly, please use the same road highlighted for vehicles. Hiking straight up the face of the hill is not permitted as per the landowner's wishes! The primarly landing is on the far side of the road. To the north of Pig the new house has requested we do not land at this property. Warning: do not land here. This Google Maps link will show you where it is located. Also marked in red, north of launch, on the map below. XC and flights are common. Glasses off nicely in the afternoon. 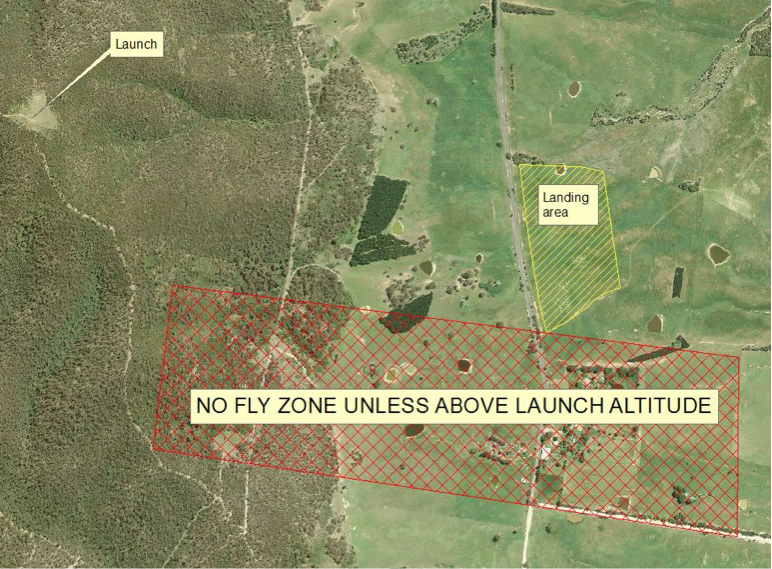 Airspace is lowish due to the proximity of Canberra Airport. You can have a look at the different layers on XC Planner or just click on the image below to give you an idea of the airspace restrictions. 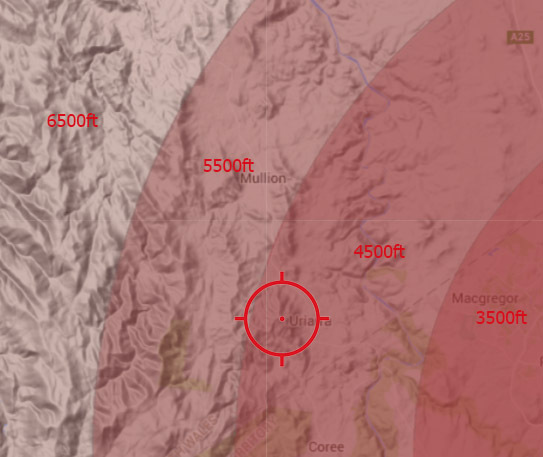 There is a no flying zone at Pig Hill below launch altitude, marked in red just south of the landing on the map, and on this map.